Being-a-Broad have just relaunched their magazine targeted at foreign women living in Japan. 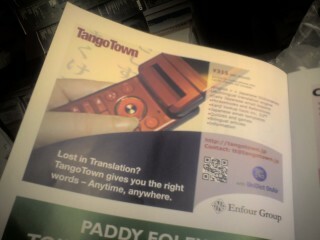 I put a TangoTown ad in this first issue. MJ created a great new design for me. Thanks babe! Do i recognise that thumb? Im pretty sure i do! That wouldnt be MJ’s thumb, would it? MJ’s thumb on MJ’s keitai, I do believe. MJ has such nice thumbs… I’m envious! hehehe any thumb in a storm! The ad turned out looking pretty good - yay!